The issue begins with three pages of the Hood cackling over his evil plan to trap and kill Captain America by luring him with his old chum Bucky, and sets out to find a suitable young man to play the role. In the meantime, Cap is loving life for the first time in quite a while. It seems the Hood has found his perfect Bucky replacement… but could he be too perfect? The Hood must have a great PR firm at his disposal, because before long, while Cap is taking in the San Francisco sights and enjoying a cup o’ joe, word reaches him by wireless. Apparently Cap turns into an eight-year-old boy when he hears astonishing news. Of course, Cap is not naive enough to believe the news wholeheartedly, but anyone can understand his need to investigate. Oh yeah, there’s a kid wot looks like Bucky there too, whom Strucker (we’ll drop the “Robo” for now) has brainwashed into thinking he’s the real Bucky Barnes (or at least says so a lot). Cap gets a chance to give his line about not needing a weapon (while he holds his mighty shield). At his first chance, Cap turns to “Bucky,” and it certainly seems as though both are considering the possibility that he’s the real thing. Yep, that shield sure comes in handy. 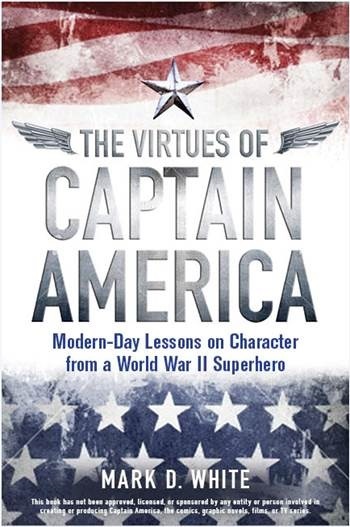 At least Strucker acknowledges Cap’s virtues of heroism and sacrifice, even if he doesn’t admire them. And while he lives through a cliffhanger straight from the 1960s Batman TV show—”How will Cap escape this timely trap? Or has his bell finally rung? Tune in next week, same Cap-time, same Cap-channel!”—Cap is more concerned about dying at the hands of a Nazi than death itself. This makes sense: as a hero, Cap likely wants to go out saving a life, not being defeated by an enemy, especially one so ideologically opposed to himself. But one final surprise: Bucky springs into action, just like… old days? Is this the real Bucky? Cap seems to be coming around to the possibility. Are you? Tune in next post, same Cap-blog, by the same Cap-blogger!